Emmanuel okwi dribbles past Egyptian Abouzeid Muhamed in the world cup qualifier at Namboole last Thursday. Courtesy photo. 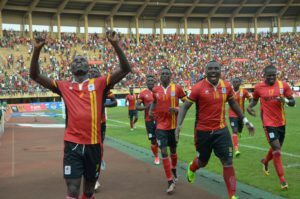 Cranes striker Emmanuel Okwi has said the Ugandan team is highly rejuvenated and stands a chance of beating Egypt in Tuesday’s World Cup qualifier between Uganda and Egypt in Alexandria. Okwi who was speaking to PML Daily Saturday morning said the Tuesday game will be different from the Thursday encounter. “For the Tuesday game, momentum shifts due to lack of home support but on the back of the result in Kampala, I think we can get a result,” he said. “We will of course fancy our chances due to the fact that they are under immense pressure to perform. We will use that as the driving factor to frustrate them from minute one and hopefuly after the final whistle, we can come home back with at least a point,” he added. Okwi who plays for Tanzanian giants Simba scored his first goal for Cranes in over three years. Okwi’s last goal before Thursday was in July 2014 in the 2-0 win over Mauritania in an AFCON qualifier. “It is always a big boost for a striker to score a goal,” Okwi said. Emmanuel Okwi (left) celebrates after scoring the lone goal that drowned the Egyptians on Thursday. Courtesy photo. “It has been a while since I last scored for the Cranes in such a high profile match and I hope that after breaking the drought, I will be able to score more and more,” he added. The former SC Villa striker is highly tipped to start in Alexandria after Thursday’s goal despite the possible return to the starting line up of Romanian based William Kizito Luwagga who came off the bench at Namboole. Luwagga, who arrived in the country late Wednesday night, has always been a starter for the Cranes and his late arrival could be the only reason he sat at the bench.